Fujifilm has announced two new F-series EXR point-and-shoot cameras for 2013. While the F850EXR and F900EXR share many of the same components -- similar megapixel counts (16) as well as the same EXR Processor II, 20x optical zoom lens with CMOS-shift Image Stabilization, EXR auto mode, Full HD 1080p video recording, a 3.0-inch LCD display, full manual controls, and special features like Motion Panorama 360 and Advanced Filters -- there are a few key differences. The F850EXR costs about $100 less than the well appointed F900 model. The price difference pretty much comes down to a less expensive (slower) EXR-CMOS image sensor and no built-in WiFi. And though the F900's "EXR-CMOS II" image processor may be a little faster, the F850EXR is still very quick, capable of shooting 9 frames-per-second (up to 5 frames) at full resolution and its Fast AF (auto focus) takes only .21 seconds. The good news is that if you don't care about instantly sharing photos via built-in WiFi, the F850EXR is "Eye-Fi" capable. Eye-Fi is a type of Memory Card that is able to wirelessly transfer photos to computers over WiFi networks. 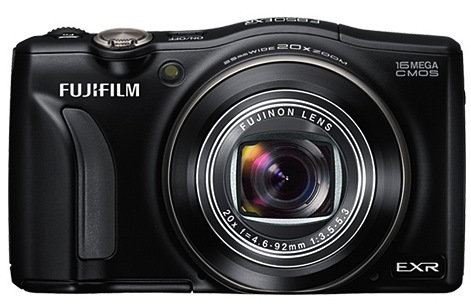 Available in colors like black, olive, red, and white, the Fujifilm FinePix F850EXR will hit stores in March (2013) with a $299.95 MSRP.